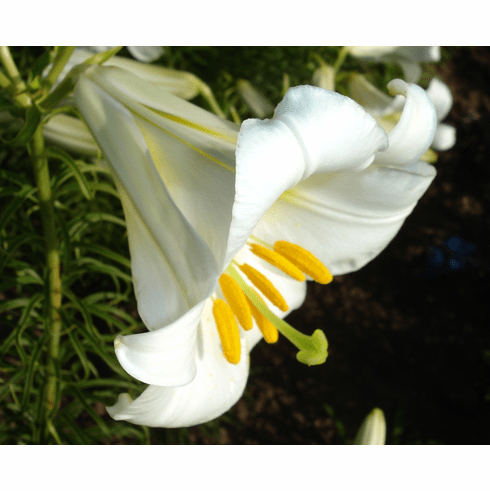 Selected out from cultivated stock of Lilium regale, the variant album has an absence of the pink-purple coloration on the outside of the flowers found in the type. Varying amounts of yellow appear in the throats of these highly fragrant flowers. Plants also tend to be much shorter than the type and do not carry quite as many flowers. Title photo taken at B & D Lilies Nursery. Photo insert #1 courtesy and copyright Pontus Wallsten, all rights reserved. Used with permission. Historic photo insert is of a late 1940's planting at the nursery of Edgar Kline of L. regale album and L. centifolium in the background as provided by Bill and Mary Hoffman.